Andrew Weil, a major proponent of the idea of self-healing (), has repeatedly acknowledged the influence of osteopaths such as Robert C. Fulford () on him, particularly regarding his philosophy of health management. Self-healing is not about completely autonomous healing; it is about healing by stimulation of the body's self-repair processes, which in some cases can be achieved by simply reducing stress. Interestingly, there are many reported cases of osteopaths curing people from various diseases by doing things like cranial manipulation and other forms of touching. We also have much evidence of health improvement through prescription of drugs that don’t appear to have any health benefits, which is arguably a similar phenomenon. The number of such reported cases highlights what seems to be a reality about diseases in general, which is that they often have a psychosomatic basis. Their “cure” involves making the person affected believe that someone can cure him, a healer, with or without drugs. The healer then cures the person essentially by her power of suggestion. Paleoanthropological evidence suggests that this healer-induced phenomenon has always been widespread among hunter-gatherer cultures, so much so that it may well have been the result of evolutionary pressures. If this is correct, how does it relate to health in our modern world? I am very interested in hunter-gatherer cultures, and I have also been living in Texas for almost 10 years now. So it is only natural for me to try to learn more about the former hunter-gatherer groups in Texas, particularly those who lived in the area prior to the introduction of horses by the Europeans. There are parks, museums, and other resources on the topic in various parts of Texas, which are at driving distance. Unfortunately much has been lost, as the Plains Indians of Texas (e.g., Comanches and Kiowas) who succeeded those pre-horse native groups have largely been forcibly relocated to reservations in Oklahoma. Anthropological evidence suggests that the earliest migrations to America have occurred via the Bering Strait, initially from Siberia into Alaska, and then gradually spreading southward to most of the Americas between 13,000 and 10,000 years ago. Much of what is known about the early Texas Indians is due to Álvar Núñez Cabeza de Vaca, a Spanish explorer who survived a shipwreck and lived among the Amerindians in and around Texas between 1528 and 1536. He later wrote a widely cited report about his experiences (). In Spanish, “cabeza de vaca” means, literally, “cow’s head”. This odd surname, Cabeza de Vaca, clearly had a flavor of nobility to it in Spain at the time. You may have heard that early American Indians were uniformly of short stature, not unlike most people at the time, but certainly shorter than the average American today. Cabeza de Vaca dispels this idea with his description of the now extinct Karankawas, a description that has been born out by anthropological evidence. The male members “towered above the Spaniards”, often 6 ft or taller in height, in addition to being muscular. The Karankawas were a distinct indigenous group that shared the same environment and similar food sources with other early groups of much lower stature. This strongly suggests a genetic basis for their high stature and muscular built, probably due to the “founder effect”, well known among population geneticists. Cabeza de Vaca and three companions, two Spaniards and one Moroccan slave, were believed by the Amerindians to be powerful healers. This enabled them to survive among early Texas Indians for several years. Cabeza de Vaca and his colleagues at times acknowledged that they were probably curing people through what we would refer today as a powerful placebo effect. Having said that, Cabeza de Vaca has also come to believe, at least to a certain extent, that he was indeed able to perform miraculous cures. He repeatedly stated his conviction that those cures were primarily through divine intervention, as he was a devout Christian, although there are many contradictory statements in this respect in his reports (possibly due to fear from the Spanish Inquisition). He also performed simple surgeries. Much has been written about Cabeza de Vaca’s life among the early Indians of Texas and surrounding areas, including the report by Cabeza de Vaca himself. One of my favorites is the superb book “A Land So Strange” () by Andrés Reséndez, a professor of history at the University of California at Davis (). The Spanish explorer’s experiences have been portrayed in the film “Cabeza de Vaca” (), which focuses primarily on the supernatural angle, with a lot of artistic license. I must admit that I was a bit disappointed with this film, as I expected it to show more about the early Indians’ culture and lifestyle. Juan Diego, the Spanish actor portraying Cabeza de Vaca, was razor thin in this film - a fairly realistic aspect of the portrayal. It is quite possible that modern humans have an innate tendency to believe in and rely on the supernatural, a tendency that is the product of evolution. We know from early and more recent evidence from hunter-gatherer societies that supernatural beliefs help maintain group cohesion and, perhaps quite importantly, mitigate the impact that the knowledge of certain death has on the mental health of hunter-gatherers. Homo sapiens is unique among animals in its awareness of its own mortality, which may be a byproduct of its also unique ability to make causal inferences. Supernatural beliefs among hunter-gatherers almost universally address this issue, by framing death as a threshold between this existence and the afterlife, essentially implying immortality. Yet, supernatural beliefs seem to also have a history of exploitation, where they are used to manipulate others. 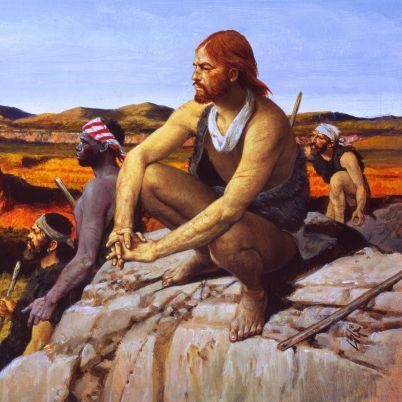 Cabeza de Vaca himself implies that, at points, he and his companions took personal advantage of the beliefs in their healing powers by the various indigenous groups with which they came into contact. Modern humans who are convinced that they have no supernatural beliefs often perceive that to be a major advantage. But there could be disadvantages. One is that they may have more difficulty dealing with psychosomatic disorders. The conscious knowledge that they are psychosomatic could possibly pale in comparison with the belief in supernatural healing, in terms of curative power. Another potential disadvantage is a greater likelihood of suffering from mental disorders. Finally, those who are sure that they have no supernatural beliefs; are they really correct? Well, subconsciously things may be different. Perhaps a good test would be to go to a “convincing” movie (i.e., not a laughable “B-level” one; for lack of a better word) about supernatural things, such as possession or infestation by evil spirits, and see if it has any effect on you. If the experience does have an effect on you, even a small one, couldn't this suggest that your subconscious belief in the supernatural may not be so easy to control in a conscious way? I suspect that having no supernatural beliefs is unnatural and unhealthy. In most cases it probably creates a conscious-subconscious conflict, and a fairly pessimist view of the world. My guess is that it is better to have those beliefs, in some form or another, and be on guard against exploitation. You can dry many types of meat, including beef, pork, goat, deer, and even some types of seafood, such as mussels. 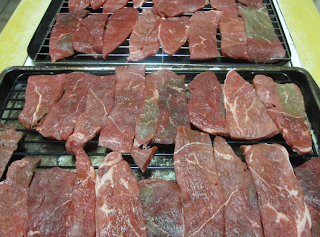 Drying meat tends to significantly increase the meat’s protein content per gram, often more than doubling it. It also helps preserve the meat, as bacteria need an aqueous environment to grow; adding salt helps further prevent bacterial growth. Dried meat preparation and consumption was common among the Plains Indians (e.g., of the Cheyenne, Comanche, and Lakota tribes), and also a valuable trade item for them. They often ground the dried meat into a powder, mixing fat and berries with them; the result of which was pemmican. Many other hunter-gatherer cultures around the world have incorporated dried meat into their diets. 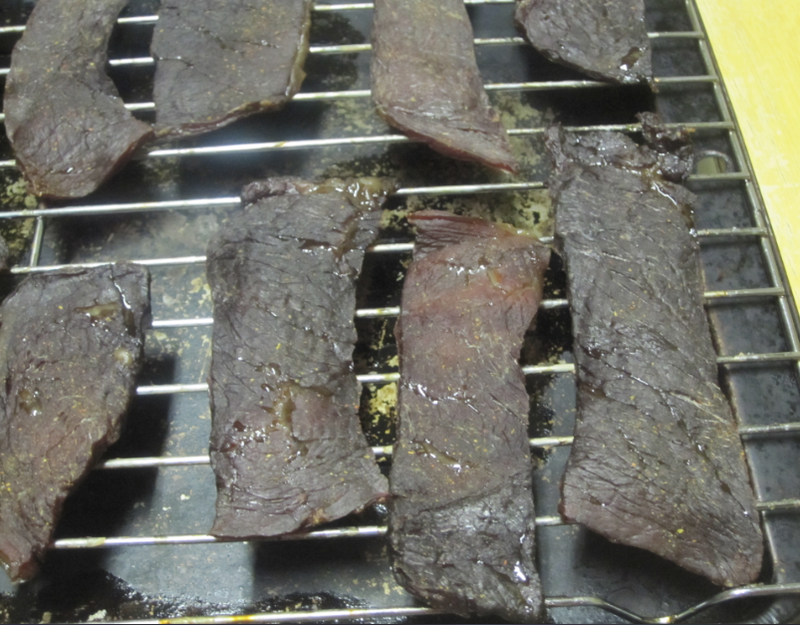 Below is a recipe for homemade beef jerky, which is very close in terms of nutrition content to the dried meat of the Plains Indians's time; that is, the time when the Plains Indians subsisted mostly on bison. Commercial beef jerky typically has a lower nutrient-to-calorie ratio, in part because sugar is added to it. 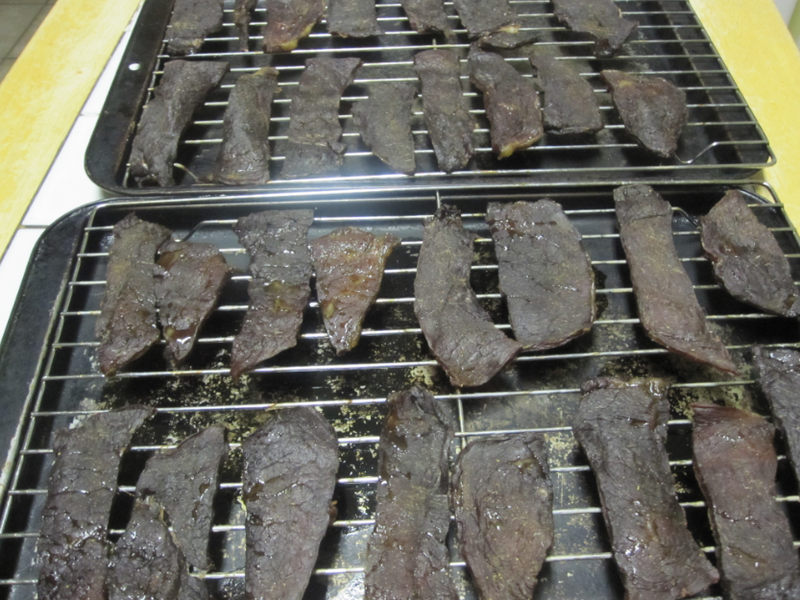 The recipe is for beef jerky, but can be used to make jerky with bison meat as well. 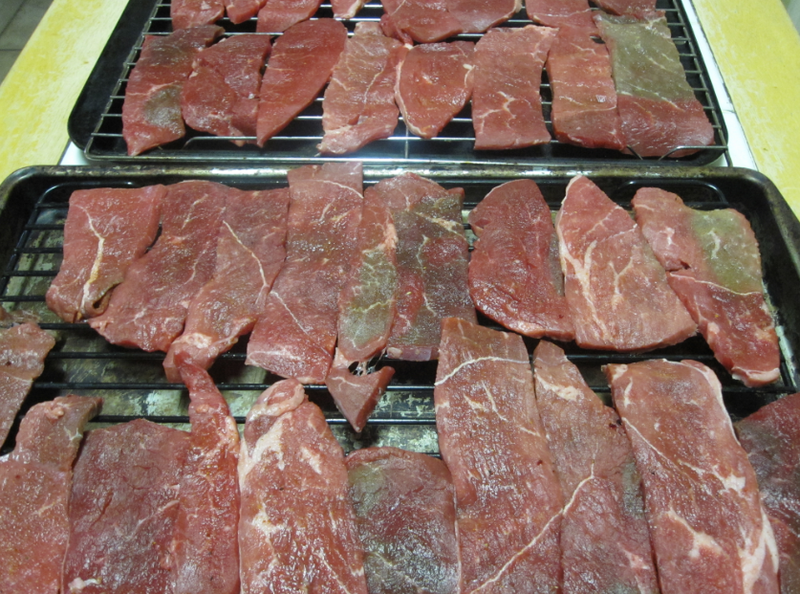 - Cut about 3 lbs of beef muscle into thin strips (see photo below). Ideally you should buy it partially cut already, with most of the fat trimmed. Cutting with or against the grain doesn’t seem to make much difference, at least to me. - Prepare some dry seasoning powder by mixing salt and cayenne pepper. - Season the strips and place them on a tray with a grid on top, so that the fat that will come off the meat is captured by the tray and doesn’t drip into the oven. - Preheat the oven to about 180 degrees Fahrenheit, and place the strips in it until you can easily pull a piece of the meat off with your fingers (see photos below, for an idea of how they would look). This should take about 1 hour or so. You will not technically be “baking” or "cooking" the meat at this temperature, although the digestibility of the final product will be comparable to that of cooked meat – i.e., greater digestibility than raw meat. - Leave the strips in the oven until they are cold, this will dry them further. 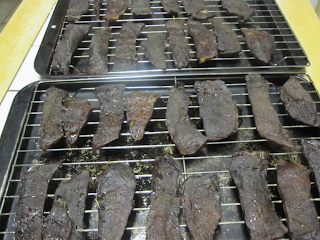 Homemade beef jerky, prepared as above, is supposed to be eaten cold. In this sense, it could be thought of as a bit like salami, but with a higher protein-to-fat ratio. If your kids eat this on a regular basis, I suspect that their future orthodontist needs will be significantly reduced. Homemade beef jerky, like the commercial one, requires some serious chewing. The dried strips of meat can be kept outside the fridge for a long time, but if you intend to keep them for more than a few weeks, I would suggest that you keep them in the fridge. Interestingly, adding sugar apparently increases the non-refrigerated shelf life of beef jerky even further. It doesn’t improve the flavor though, in my opinion. This is a zero-carbohydrate food item, which may be a good choice for those who are insulin resistant or diabetic, and also for those on low-carbohydrate or just-enough-carbohydrate diets. Often I hear bodybuilders who eat multiple meals per day to say that it is hard for them to prepare high-protein snacks that they can easily carry with them. Well, beef jerky is one option.